As we wrap up the calendar year, there is a final batch of quality App Store releases this week. 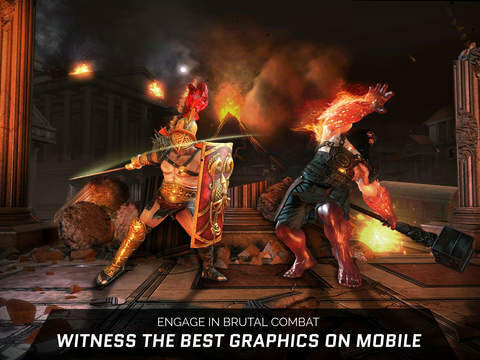 Gameloft starts things off with their latest free to play offering, Gods Of Rome, a one-on-one fighting game in the same vein as Mortal Kombat X and Injustice: Gods Among Us. It goes for a mythological theme as players take control of “powerful gods have been summoned to brutal battle”. Swipe and tap your way to glory. Into the Dim, the latest release from Happymagenta, combines rogue-like and turn-based strategy gameplay and a Nintendo Gameboy monochromatic aesthetic as you explore dungeons, battle creatures and solve puzzles. ZeptoLab’s latest fun-filled physics puzzle game sequel, Cut the Rope: Magic. 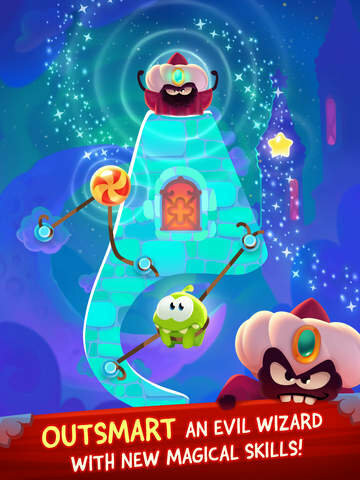 In this magical new adventure, Om Nom faces off against an evil wizard who has stolen his sweets. Adorned with all-new magical transformation abilities, Om Nom can turn himself into a bird, to help him reach obstacles an traps above, he can shrink to the size of a baby to get into some tight spaces, dive under water in his fish form, follow his nose in mouse form to seek out the cheese err candy and finally become a ghostly spirit to allow objects to pass through him. While the gameplay feels instantly fun and familiar, the boss battles coupled with these new shape-shifting elements allow for a some neat new puzzle designs ensuring this latest sequel still feels fresh and entertaining. A steal at just 99¢ you really cannot go wrong picking this one up. And seeing the kind of support ZeptoLab has thrown behind its previous Cut The Rope titles, you can expect some great updates in the future a well. 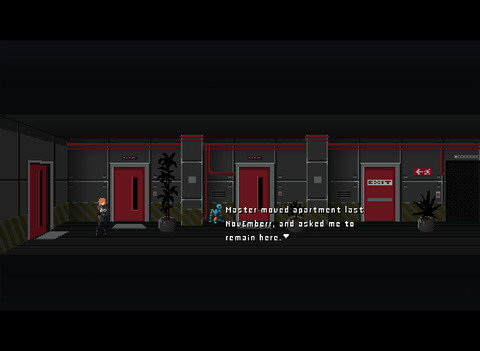 First from designer Peter Moorhead and publisher Curve Digital Games (Thomas Was Alone) comes an interactive short story adventure game called Murder, “about the intersection of morality and sentience, in a future where both are commodities.” This relatively brief 20 to 30 minute games sets out to redefine the point and click adventure game genre by offering “something in-between the classic adventure game style and its modern minimal interpretation.” The game features full voice acting and each character has their own “individual visual identity and style”. This sounds like an interesting concept and one I will definitely be spending a buck on to check it out. 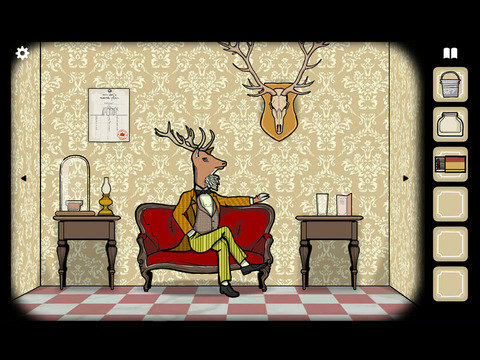 Rusty Lake Hotel is my first experience with Rusty Lake’s rather extensive catalog of offbeat adventure games and boy is it an interesting one. You are responsible for welcoming Mr. Owl’s esteemed animal guests to the mysterious Rusty Lake Hotel. Over the course of the next few days, five succulent dinners will be served and you must “make sure every dinner is worth dying for”. Unbeknownst to the guests…they are on the menu. Each night you must enter one of the guests rooms and solve a series of puzzles to eventually murder the guest and collect the meat necessary for the chef to prepare the next evening’s meal. It is a creepy and morbid tale (definitely not suited for children) with some rather tough but rewarding puzzles as you try to solve your way out of each of the guest rooms. I will (and already have) started checking out more of this studios’ ‘escape the room’ style adventure games set in this same weird universe. Frogmind delivers a gorgeous and worthy sequel to its stellar 2013 atmospheric puzzle platformer BADLAND. 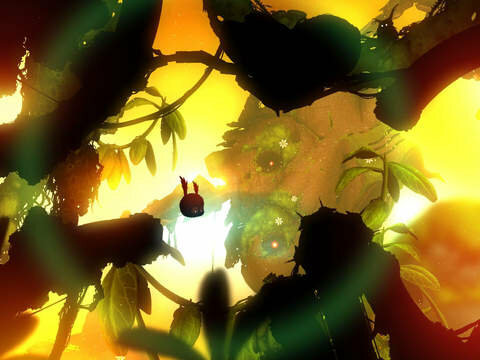 In BADLAND 2, players will find themselves immediately engaged and entrenched in this dark, unique and mysterious world that is BADLAND. Players must attempt to survive this ever-moving and constantly weaving world or light and shadow as they try to avoid danger at every turn. As poetic as it is dangerous, levels flow seamlessly into one another and you can’t help but get sucked into this rich, perilous universe that Frogmind has so expertly crafted. Much like the original, BADLAND 2 is a showpiece for the iOS platform and deserves a place in everyone’s iOS gaming catalog. If the original is any indicator, you can also expect a lot of value from your $4.99 purchase with a good deal of free content updates and support from Frogmind going forward. A stylish auto-run puzzle platformer, Blown Away: Secret of the Wind offers a neat new take on the genre thanks to its unique teleporting movement mechanic. You play as Hendrik, a single-haired, teleportation shoe-wearing creature on a mission to find the scattered remains of his home. 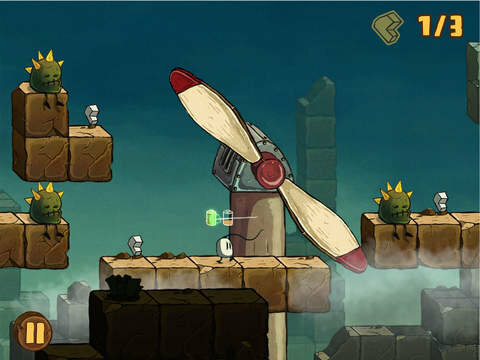 By running on the ground you recharge Hendrik’s shoes and then simply tap anywhere to teleport him to a new location. However you need to make sure where ever he teleports to he’ll have enough running room to recharge his shoes for another jump or you’ll find Hendrick quickly plummeting to his demise and will have to restart the level over. Requiring a mix of planning, memory and luck, this latest offering from Black Pants Studio was one of this week’s unexpected pleasant little surprises. First up, it’s time for another Toca Boca title, Toca Blocks. The 30th app released by the Swedish studio responsible for bringing so much joy to kids from around the world, Blocks was developed by the team behind Toca Nature. 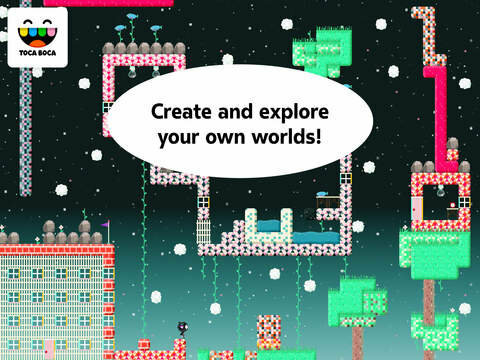 It is a cute world-building app which lets kids be architects, creating worlds from their imaginations and then play in them. This being a Toca Boca title, their building materials aren’t just ordinary blocks, but instead, the different blocks have unique properties, some are bouncy, others are sticky and kids can combine and stack blocks to make unique new blocks. That amazing trackball from Toca Builders returns for easy panning of your building area. Use a template or start from scratch, at any time you can explore the world you’ve created using one (or more) of the silly inhabitants. 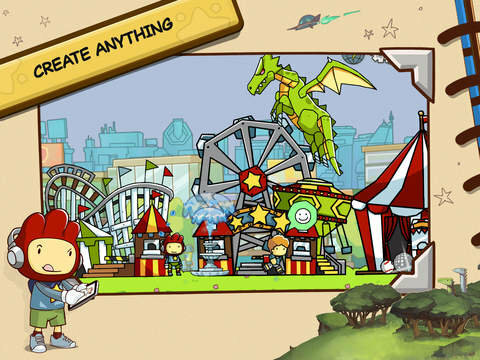 The fourth title in the Scribblenauts franchise, Scribblenauts Unlimited makes its way to iOS this week after launching for the Wii U, PC and Nintendo 3DS in November 2012. Spread across multiple worlds, you start off by playing as either Maxwell or his farmer brother Edwin and use your imagination to solve loads of puzzles, either by summoning a particular object by writing it down in your magical notepad, or by transforming existing objects with the addition of a single adjective. My 8 year-old daughter had never experienced a Scribblenauts game before and was absolutely blown away by having the ability to conjure up whatever she wanted, simply by typing what she wanted. Quickly we stopped playing it safe with the “obvious” solution and tried to some things with creative, outside the box thinking, usually with hilarious results. Limited only by their imaginations, adults and kids alike will have a great time learning about Maxwell’s parents and siblings (41 in all) as they use creativity and ingenuity to solve the tricky puzzles. 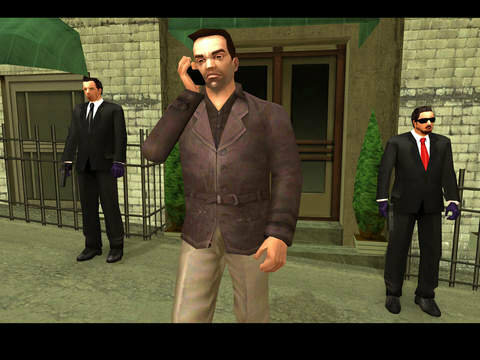 And finally, Rockstar Games returns with another GTA port for iOS. This time around it is Grand Theft Auto: Liberty City Stories, their standalone compilation of the episodes for 2008’s Grand Theft Auto IV. After spending time in hiding following the murder of a made man, Toni Cipriani returns home to Liberty City to find the city in turmoil, “as warring families vie for control and the town begins to self-destruct under waves of political corruption, organized crime, drug trafficking and union strikes”. It’s up to Toni to restore order to the chaos and “bring the city back under Leone family control”. Featuring new high resolution textures and character art as well as real time lighting and shadows and 60 FPS gameplay on Apple’s latest iOS devices and even 3D touch support, this open world adventure game has arguably never looked better. And that will do it for this week…Happy Holidays!